Warmer water, clearer water. Lots of bait choices but watch the tides for where to fish. Warm start around 80 with evening showers on Monday. The rest of the week a mix of sun and clouds with highs in the mid 60s before hitting 70 on Friday going into the weekend. Overnight lows on the mid 50s. Water temp staying above 55. Where to fish according to tides is key. Move toward the shore with higher water and retreat as the tide drops. At higher tides, flooded wood and docks are good targets, but finding grass is key. This is especially important when the tides drop. Fish are moving into scattered emerging grass. At high tides, jigs, tubes and shakyheads are good to pitch to cover and docks. Use 12 pound test Gamma Edge Fluorocarbon tied to 20 pound Torque braid for spinning gear or 12 pound Edge spooled on casting gear. Skip baits under docks and let them sit a bit. Find the right presentation of the day. Hops or drags are a good way to start. Otherwise stay on the move with chatterjigs, lipless crankbaits, and spinnerbaits to trigger bites. Again all with 12 pound Edge. Contact grass or drag along the bottom. Speed is key, a bit faster in clear water, but in general, slow down. Black/blue chatterjigs with matching trailers have been working, but keep other colors on deck. One of the best months for big Potomac bass! Fish move up, staging near spawning flats, creek mouths, backs of coves, and out-of-the-current areas! Start slow, then speed up! Moving baits cover water, but once you find what’s holding them, slow with plastic and jig presentations. Dock fishing is starting! Longer days, warmer temperatures make it easier to catch shallow fish. Look for Milfoil and Water Celery grasses emerging on main river areas above and below the Wilson Bridge, the mouths of Swan, Broad and Piscataway creeks and Washington Channel along Fort McNair…keys to finding and catching bass. Hard cover, like rip rap, docks, laydowns and barges are places to find bass. OVERVIEW - Lots of rain predicted for this weekend, creating rising and stained water. Be careful and call ahead before venturing out. Throughout the state, good fish are being caught. Patience and persistence is sometimes necessary, along with an understanding of what fish are doing during this season of the year. The better baits for bass are normally rattling crankbaits, spinnerbaits and plastic lizards and creature baits. Topwater jerk baits are coming into their own as the water temperatures rise. POTOMAC RIVER - D.C. - Bass are hitting plastic baits, crankbaits and spinnerbaits, worked in and around any shallow cover from Blue Plains to the Woodrow Wilson Bridge. Dropoffs are also producing bass on deep-diving crankbaits, Rat-L-Traps, Chatterbaits and plastic baits. Catfish are hitting cut baits throughout the river, when fished on flats adjacent to deep water. Herring, shad, white perch, catfish and stripers are thick around Fletcher's Boathouse area. RAPPAHANNOCK RIVER: RAPPAHANNOCK RIVER: POTOMAC RIVER: Reel Bass Adventures reports heavy winds at the beginning of the week caused bass to back off to deeper water. Creek ledges in front of emerging spatterdock pads had good numbers of bass that liked plastic worms, grubs and small medium running crank baits. Crappie fishing slowed a little, but there are many catfish in shallow waters intercepting bass baits. LAKE ANNA: McCotter’s Lake Anna Guide Service reports water temperatures have reached the magic 60-degree mark and bass and crappie are spawning with striper not far behind. Largemouth bass are moving to shallow areas in the mid and down lake region to spawn. Try soft plastic jerkbaits, crawfish, lizards, or your favorite creature style bait. The hottest zone is from the Route 208 bridge and down. Brandon Sovick shared a post to the group: Virginia Bass League. Buggs Results Great job everyone! Saltwater- Flounder catches are increasing along the Eastern Shore in areas like, Wachapreague and Chincoteague.Drifting minnows along the drop offs of the shallow flats is productive. Catches have also been made inside Rudee Inlet.Tautog catches continue to be strong, and are being caught from the bridge tunnel now. The bigger Togs are still coming from ocean structures however. Black Drum catches are increasing as we are upon the full moon, as of the 18th. Freshwater- Bass, in lakes and ponds, are in full spawning mode. 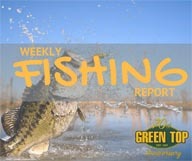 Anglers report a big wave of Bass moving up just prior to the weekend. 30 lbs won the 2 day, Mr. Bass event at Lake Gaston. Kenny Wright, and Charlie Seymour were the winners. 18 lbs won the Elite 70 event at Kerr Reservoir. Joh Hall, and Matt Martin were the winners. Many anglers report targeting bedding fish at both events. Bass at Anna are in spawning mode also. The Stripers are making their spawning run at Kerr. These fish make long runs into the headwaters of the lake. Both the Dan, and Staunton rivers attract the Stripers. Stripers are being caught well at Anna also. Capt. Art Conway of Conway’s River Rat Guide Service (804-514-1486) out of Ed Allen’s Boats and Bait reported that Chickahominy Lake mid-day water temperatures were in the low 70’s in the lower main lake and major creeks on Wednesday (4/17/2019). The lake level was about 5 inches above the top of the dam. The water was medium brown and clear in the central lake, and cloudy along downwind shorelines. active, cats were hitting live minnows and cut bait. Some crappie remained in creeks, but many crappie had moved out of the major creeks and were spawning on wood cover on flats in the main lake. Active crappie were hitting live minnows, Wright Bait Co. and Southern Pro curlytail jigs, small tubes, Kalin crappie scrubs, and small swim baits. Yellow and white perch were scattered or in loose aggregates on deep flats, drop-offs, and channels in the main lake, with some moving into major creeks. McCotter's Lake Anna Guide Service With the start of the tournament season upon us (I think Fishers of Men visits this weekend) I wanted to wish everyone good luck as well as try and get a little more regular with a fishing report/forecast. So good luck this weekend and this season, and I hope you find something helpful in our reports. The wind may make it difficult to feel the bite and the cold may make it difficult to feel your fingers. But a fish like this will make you forget about all that. Keith caught this beauty with Jason yesterday. Persistence always pays off. Great catch! 22 hrs · Cordell Tobin, with his lucky Woods & Waters Magazine cap, caught all these for a 20-pound limit today. Most were caught using a FITT Premium Lures Chilly Willy. He also had the LKA Grand Slam by 9:36. Virginia offers some of the best early season turkey hunting opportunities in the eastern region. Welcome to the NHBA group. Group members are encouraged to post and interact with other members. Dedicated to the love of bass fishing and raising awareness and interest in the sport of fishing.